This is pretty impressive work by Google! They are seeing the objective behind the query. 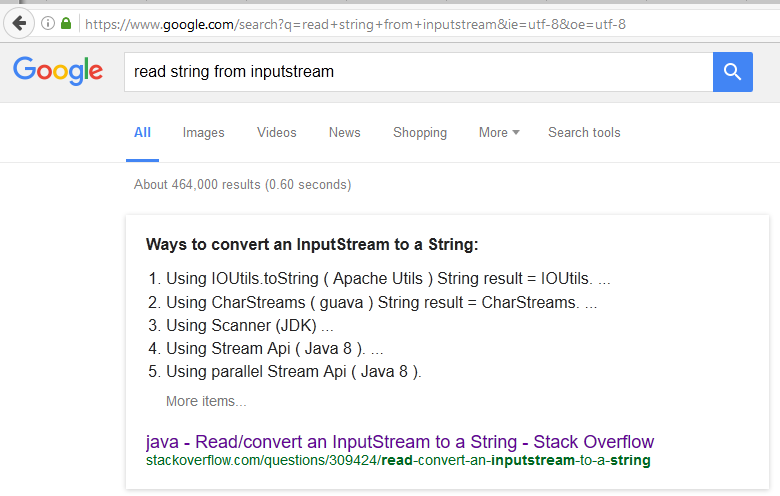 It’s pretty simple, in theory, to see the verb “read” operating on the object “string” with source (i.e., “from) being consistent with an input stream (also handling the concatenated compound). More impressive is that they have learned from such queries and content that people view following such queries, perhaps even more deeply, that character streams, scanners, and stream APIs are relevant. And they have also narrow my results based on the frequency that I look at Java versus other implementation languages.